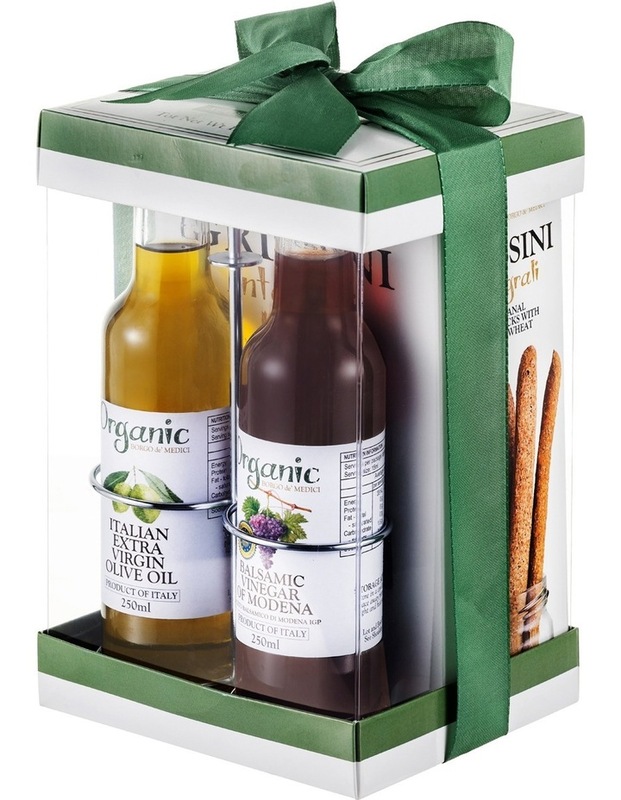 All organic ingredients for this special set made in Italy. Extra Virgin Olive Oil is the King of the Italian kitchen and a principal element in the Italian Gastronomic Heritage. 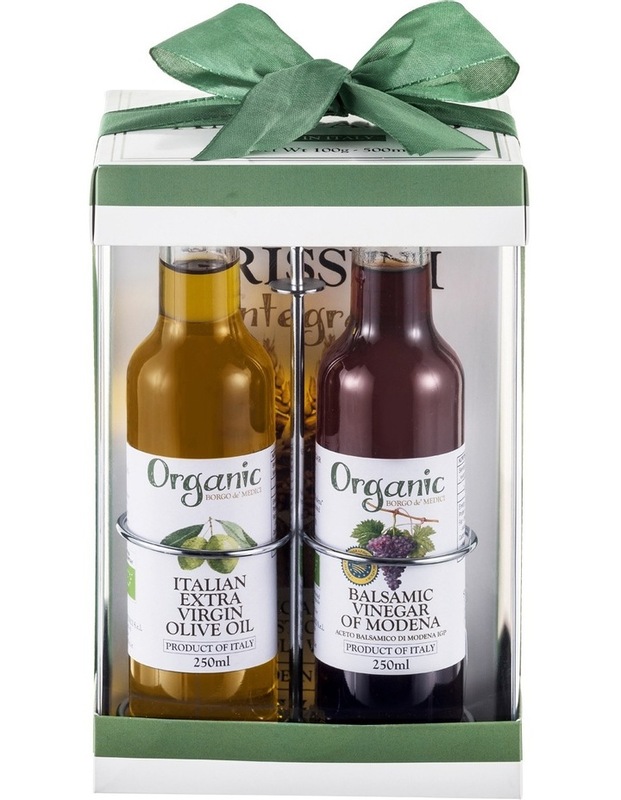 This is an unrefined oil, as it is not treated with chemicals or altered by temperature, and the highest-quality olive oil you can buy, as there are very specific standards oil has to meet to receive the label "extra-virgin." Depending on the year of the harvest, the climate, the kind of olives used and their provenience, it can have a different combination of the following characteristics: a spicy fruit flavor; milder, aromatic, buttery, and floral notes or grassy, herbaceous, bitter, and pungent ones. Fruitiness also varies with the variety of olive. Even the color can range from deep grassy green to bright, yellowy gold. This variance is due to the level of chlorophyll in the olives when they are pressed. Extra Virgin Olive oil makes an excellent choice for nearly every kind of dish. It is the best dressing for salads, vegetable, meat and fish dishes. At home as in hotel, at snack bars as in restaurants, you will always find extra virgin olive oil on an Italian table, as its healthy aspects and nutritional values make it been the best condiment ever. Balsamic Vinegar of Modena PGI is a dark, glossy, sweetly sour, condiment obtained from concentrated grape must and wine vinegar. Capable of enhancing the taste of any dish, together with Extra Virgin Olive Oil, this is one of those inevitable condiment in Italian kitchen and as well as Evoo this is a principal element in the Italian Gastronomic Heritage too. The lettering PGI stay for Protected Geographical Indications, as from the 3rd July 2009, the designation Balsamic Vinegar of Modena is protected under regulation, by the European Union. The most common use for balsamic vinegar is as a salad dressing. Together with Evoo this makes the most healthy and delicious condiment for salads. Blended together with evoo, some grated Parmesan cheese and a dash of mustard, in a food processor, you can also create a creamy balsamic vinaigrette. Besides being a great condiment, balsamic vinegar also makes an amazingly flavorful marinade for grilled meat and a great accompaniment for cheeses, try it on a thin slice of Parmesan Cheese, you will fall in love with it! The sweetness of balsamic vinegar is also exactly what makes it a creative and intelligent ingredient to use in desserts, for example it pairs naturally with strawberries. Surprise your guests with a Panna cotta dessert with Strawberries and Balsamic Vinegar. Grissini, whole wheat crackers are the most versatile crackers, you can enjoy trying different combinations and pairing them with the ingredients you like at most: from cheese with jams or marmalade, smoked ham with a slice of hardboiled egg, to vegetables. They can be also a tasty substitute of bread for a lunch. Straight from the pack they can a be the perfect snack for a break.